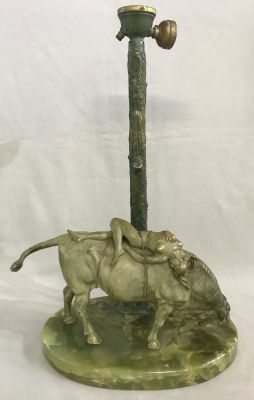 A bronze sculpture of “Europa and the Bull”, forming the base of a table lamp, circa 1930. The lamp needs to be rewired. The green onyx base is 12” by 7 3/4”. To the top of the lamp is 19 1/2”. In Greek mythology Europa is the story of the mother of the King of Crete, a woman of Phoenician origin, after whom the continent of Europe is named. The story of her abduction by Zeus in the form of a bull was a Cretan story.